During war time, life's challenges become even more challenging. 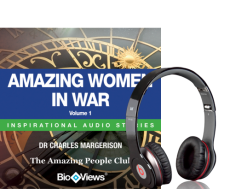 This collection of great audio stories from The Amazing People Club focuses on four amazing women during times of war. Still a teenager, Joan of Arc led French armies into battle during the Hundred Years War. Edith Cavell helped Allied Soldiers escape from Germany-occupied Belgium during World War 1 and lived by a personal motto: "I can’t stop while there are lives to be saved." Harriet Tubman was a slave abolitionist and humanitarian and suffered unimaginable things in the fight for what was right, particularly during the American Civil War. Mary Edwards Walker was a nurse during the American Civil War and became the only woman to receive the Medal of Honor. Each woman in this collection had a very different set of circumstances but each fought for others in their amazing quests to fight for what they believed in. These stories come alive through BioViews and reveal their life stories in the context of the times and their personal lives which makes their stories even more real.